​​​​​​ ​DIMMITT – The Castro County Hospital District is finishing construction on Country View Living, a new long-term care and assisted-living facility at 701 Butler Blvd. 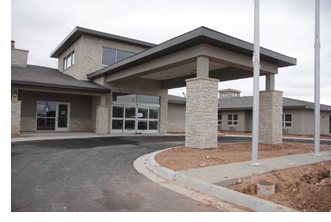 The property ​​features 26 private rooms, 14 semi-private care rooms, and five assisted-living apartments. The district has partnered with Luby’s Culinary Services, Starbucks, and Fuddrucker’s to provide more dining choices to residents.